F-4 Notes to Consolidated Financial Statements. These consolidated financial statements have been prepared in accordance with accounting principles generally accepted in the United States of America for interim financial information and the SEC instructions to Form 10-Q. In the opinion of management, all adjustments considered necessary for a fair presentation have been included. Operating results for the interim period ended June 30, 2016 are not necessarily indicative of the results that can be expected for the full year. Description of business – Skinvisible, Inc., (referred to as the “Company”) is focused on the development and manufacture and sales of innovative topical, transdermal and mucosal polymer-based delivery system technologies and formulations incorporating its patent-pending formula/process for combining hydrophilic and hydrophobic polymer emulsions. The technologies and formulations have broad industry applications within the pharmaceutical, over-the-counter, personal skincare and cosmetic arenas. Additionally, the Company’s non-dermatological formulations, offer solutions for a broad spectrum of markets women’s health, pain management, and others. The Company maintains executive and sales offices in Las Vegas, Nevada. History – The Company was incorporated in Nevada on March 6, 1998, under the name of Microbial Solutions, Inc. The Company underwent a name change on February 26, 1999, when it changed its name to Skinvisible, Inc. The Company’s subsidiary’s name of Manloe Labs, Inc. was also changed to Skinvisible Pharmaceuticals, Inc.
On September 9, 2014, the Company formed Kinatri USA Inc., a wholly-owned subsidiary, to market a premium line of scientifically formulated skincare products powered by our patented Invisicare® technology. As part of its strategic focus on revenue generation and creating shareholder value, Kintari USA Inc. products will be sold via network marketing. The Kintari product portfolio consists of anti-aging products to help fight the signs of aging. These products have been developed using proven anti-aging ingredients with scientific evidence of their effectiveness at reducing the look of fine lines and wrinkles resulting in youthful looking skin. These potent ingredients will be powered by patented Invisicare technology, providing consumers with unique, effective products which the Company believes cannot be duplicated. Additional products will be added to enhance this product line as the Company grows and expands. Going concern – The accompanying financial statements have been prepared on a going concern basis, which contemplates the realization of assets and the satisfaction of liabilities in the normal course of business. The Company has incurred cumulative net losses of $28,908,308 since its inception and requires capital for its contemplated operational and marketing activities to take place. The Company’s ability to raise additional capital through the future issuances of common stock is unknown. The obtainment of additional financing, the successful development of the Company’s contemplated plan of operations, and its transition, ultimately, to the attainment of profitable operations are necessary for the Company to continue operations. The ability to successfully resolve these factors raise substantial doubt about the Company’s ability to continue as a going concern. The consolidated financial statements of the Company do not include any adjustments that may result from the outcome of these aforementioned uncertainties. Principles of consolidation – The consolidated financial statements include the accounts of the Company and its subsidiaries. All significant intercompany balances and transactions have been eliminated. Use of estimates – The preparation of consolidated financial statements in conformity with accounting principles generally accepted in the United States requires management to make estimates and assumptions that affect the reported amounts of assets and liabilities and disclosure of contingent assets and liabilities at the date of the consolidated financial statements and the reported amounts of revenue and expenses during the reporting period. Actual results could differ from those estimates. For purposes of the statement of cash flows, the Company considers all highly liquid investments and short-term debt instruments with original maturities of three months or less to be cash equivalents. There are $0 and $0 in cash and cash equivalents as of June 30, 2016 and December 31, 2015, respectively. The carrying amounts reflected in the balance sheets for cash, accounts payable and accrued expenses approximate the respective fair values due to the short maturities of these items. As required by the Fair Value Measurements and Disclosures Topic of the FASB ASC, fair value is measured based on a three-tier fair value hierarchy, which prioritizes the inputs used in measuring fair value as follows: (Level 1) observable inputs such as quoted prices in active markets; (Level 2) inputs, other than the quoted prices in active markets, that are observable either directly or indirectly; and (Level 3) unobservable inputs in which there is little or no market data, which require the reporting entity to develop its own assumptions. Product sales – Revenues from the sale of products (Invisicare® polymers) are recognized when title to the products are transferred to the customer and only when no further contingencies or material performance obligations are warranted, and thereby have earned the right to receive reasonably assured payments for products sold and delivered. Royalty sales – The Company also recognizes royalty revenue from licensing its patented product formulations only when earned, when no further contingencies or material performance obligations are warranted, and thereby have earned the right to receive and retain reasonably assured payments. Distribution and license rights sales – The Company also recognizes revenue from distribution and license rights only when earned (and are amortized over a five year period), when no further contingencies or material performance obligations are warranted, and thereby have earned the right to receive and retain reasonably assured payments. Accounts Receivable – Accounts receivable is comprised of uncollateralized customer obligations due under normal trade terms requiring payment within 30 days from the invoice date. The carrying amount of accounts receivable is reviewed periodically for collectability. If management determines that collection is unlikely, an allowance that reflects management’s best estimate of the amounts that will not be collected is recorded. Management reviews each accounts receivable balance that exceeds 30 days from the invoice date and, based on an assessment of creditworthiness, estimates the portion, if any, of the balance that will not be collected. As of June 30, 2016, the Company had not recorded a reserve for doubtful accounts. The Company has $1,135,000 in convertible notes payable which are secured by the accounts receivable of a license agreement the Company has with Women's Choice Pharmaceuticals, LLC on its proprietary prescription product, ProCort®. Inventory – Substantially all inventory consists of finished goods and are valued based upon first-in first-out ("FIFO") cost, not in excess of market. The determination of whether the carrying amount of inventory requires a write-down is based on an evaluation of inventory. Goodwill and intangible assets – The Company follows Financial Accounting Standard Board’s (FASB) Codification Topic 350-10 (“ASC 350-10”), “Intangibles – Goodwill and Other”. According to this statement, goodwill and intangible assets with indefinite lives are no longer subject to amortization, but rather an annual assessment of impairment by applying a fair-value based test. Fair value for goodwill is based on discounted cash flows, market multiples and/or appraised values as appropriate. Under ASC 350-10, the carrying value of assets are calculated at the lowest level for which there are identifiable cash flows. Income taxes – The Company accounts for its income taxes in accordance with FASB Codification Topic ASC 740-10, “Income Taxes”, which requires recognition of deferred tax assets and liabilities for future tax consequences attributable to differences between the financial statement carrying amounts of existing assets and liabilities and their respective tax bases and tax credit carry-forwards. Deferred tax assets and liabilities are measured using enacted tax rates expected to apply to taxable income in the years in which those temporary differences are expected to be recovered or settled. The effect on deferred tax assets and liabilities of a change in tax rates is recognized in income in the period that includes the enactment date. Stock-based compensation – The Company follows the guidelines in FASB Codification Topic ASC 718-10 “Compensation-Stock Compensation”, which requires the measurement and recognition of compensation expense for all share-based payment awards made to employees and directors including employee stock options and employee stock purchases related to an Employee Stock Purchase Plan based on the estimated fair values. Stock based compensation expense recognized under ASC 718-10 for the six months ended June 30, 2016 and 2015 totaled $133,445 and $0, respectively. Earnings (loss) per share – The Company reports earnings (loss) per share in accordance with FASB Codification Topic ASC 260-10 “Earnings Per Share”, Basic earnings (loss) per share is computed by dividing income (loss) available to common shareholders by the weighted average number of common shares available. Diluted earnings (loss) per share is computed similar to basic earnings (loss) per share except that the denominator is increased to include the number of additional common shares that would have been outstanding if the potential common shares had been issued and if the additional common shares were dilutive. Diluted earnings (loss) per share has not been presented since the effect of the assumed exercise of options and warrants to purchase common shares (common stock equivalents) would have an anti-dilutive effect. Depreciation expense for the three months ended June 30, 2016 and 2015 was $790 and $790, respectively. Patents and trademarks are capitalized at their historical cost and are amortized over their estimated useful lives. As of June 30, 2016, patents and trademarks total $646,169, net of $372,615 of accumulated amortization. Amortization expense for the six months ended June 30, 2016 and 2015 was $28,164 and $27,956, respectively. License and distributor rights (“agreement”) were acquired by the Company in January 1999 and provide exclusive use distribution of polymers and polymer based products. The Company has a non-expiring term on the license and distribution rights. Accordingly, the Company annually assesses this license and distribution rights for impairment and has determined that no impairment write-down is considered necessary as of June 30, 2016. The following is a summary of option activity during the six months ended June 30, 2016. As of June 30, 2016, all stock options outstanding are exercisable. On February 10, 2016, the Company granted stock options for 4,150,000 options to purchase shares of its common stock to its officers and directors. The options have a strike price of $0.02. The stock options were exercisable upon grant and have a life of 3 years. The stock options were valued at $99,167 using the Black-Scholes option pricing model. The Company recorded an expense of $99,197 for the six months ended June 30, 2016. The following is a summary of warrants activity during the three months ended June 30, 2016. On May 22, 2013, the Company approved a financing plan to offer accredited investors up to $1,000,000 in secured promissory notes. During the year ended December 31, 2013, the Company entered into twenty-four 9% notes payable to investors and received total proceeds of $1,000,000. The notes are due two years from the anniversary date of execution. The Notes are secured by the US Patent rights granted for the Company's Sunscreen Products: US patent number #8,128,913: "Sunscreen Composition with Enhanced UV-A Absorber Stability and Methods.” During six months ending June 30, 2016 the Company made principal payments of $nil. On May 19, 2014, the Company approved a financing plan to offer accredited investors up to an additional $1,000,000 in secured promissory notes. For the period from May 19, 2014 to March 31, 2015 the Company entered into twenty-seven 9% notes payable to investors and received total proceeds of $1,000,000. The notes are due two years from the anniversary date of execution. The Notes are secured by the US Patent rights granted for the Company's Sunscreen Products: US patent number #8,128,913: "Sunscreen Composition with Enhanced UV-A Absorber Stability and Methods." As of June 30, 2016, $935,500 in notes have reached their initial maturity date. Note holders of $199,400 in debt executed agreements extending their notes for an additional 12 months upon the same terms. The extended notes will mature between August 1, 2016 and October 6, 2016. During the period from April 1, 2015 and September 30, 2015, the Company entered into thirteen additional 9% notes payable to investors and received total proceeds of $326,000. The notes are due two years from the anniversary date of execution. The Notes are secured by the US Patent rights granted for the Company's Sunscreen Products: US patent number #8,128,913: "Sunscreen Composition with Enhanced UV-A Absorber Stability and Methods". On January 27, 2016, the Company entered into a 12% unsecured note payable to an investor and received total proceeds of $33,000. The note was due on April 30, 2016. The maturity has been extended to May 30, 2016. On January 27, 2016, we entered into a promissory note pursuant to which we borrowed $24,000. Interest under the note is at 10% per annum, and the principal and all accrued but unpaid interest was due on February 15, 2016. As of June 30, 2016, $2,178,500 of the Notes were due in less than 12 months and have been classified as current notes payable. During the six months ended 2016, an officer advanced $16,700 to support the daily operations of the company. The advance is due on demand and bears no interest. As of June 30, 2016, $26,469 remained due to related parties as repayment for advanced monies, all related other party notes have been extinguished or re-negotiated as convertible notes. See note 10. On July 28, 2015, the Company entered into a convertible promissory note pursuant to which it borrowed $47,500. Interest under the convertible promissory note is 8% per annum, and the principal and all accrued but unpaid interest is due on April 30, 2016. The note is convertible at any time following 180 days after the issuance date at noteholders option into shares of our common stock at a variable conversion price of 58% of the lowest average three day market price of our common stock during the 10 trading days prior to the notice of conversion, subject to adjustment as described in the note. The holder’s ability to convert the note, however, is limited in that it will not be permitted to convert any portion of the note if the number of shares of our common stock beneficially owned by the holder and its affiliates, together with the number of shares of our common stock issuable upon any full or partial conversion, would exceed 9.99% of the Company’s outstanding shares of common stock. During the quarter ending June 30, 2016, the Company paid $72,458 to the note holder to settle the note in full. The payment included interest and prepayment penalties of $24,958. $135,000 face value 9% unsecured notes payable to investors, due October 26, 2017. At the investor’s option until the repayment date, the note and related interest may be converted to shares of the Company’s common stock a discount of 90% of the current share price after the first anniversary of the note. The notes are secured by the accounts receivable of a license agreement the Company has with Womens Choice Pharmaceuticals, LLC on its proprietary prescription product, ProCort®. The Company has determined the value associated with the beneficial conversion feature in connection with the notes and interest to be $117,535. The aggregate original issue discount feature has been accreted and charged to interest expenses as a financing expense in the amount of $29,303 during the six months ended June 30, 2016. The original issue discount feature is valued under the intrinsic value method. On December 17, 2015, the Company entered into a convertible promissory note pursuant to which it borrowed $25,000. Interest under the convertible promissory note is 10% per annum, and the principal and all accrued but unpaid interest is due on May 17, 2016. The note is convertible into 1,250,000 shares of the Company’s common stock at a price of $0.02 per share and 625,000 warrants exercisable at $0.04 per share. On February 1, 2016, the Company entered into a convertible promissory note pursuant to which it borrowed $25,000. Interest under the convertible promissory note is 10% per annum, and the principal and all accrued but unpaid interest is due on July 25, 2016. The note is convertible into 1,250,000 shares of the Company’s common stock at a price of $0.02 per share and 625,000 warrants exercisable at $0.02 per share. On February 1, 2016, the Company entered into a convertible promissory note pursuant to which it borrowed $38,000. Interest under the convertible promissory note is 10% per annum, and the principal and all accrued but unpaid interest is due on February 15, 2017. The note is convertible into 1,900,000 shares of the Company’s common stock at a price of $0.02 per share and 950,000 warrants exercisable at $0.02 per share. On February 17, 2016, the Company entered into a convertible promissory note pursuant to which it borrowed $20,000. Interest under the convertible promissory note is 9% per annum, and the principal and all accrued but unpaid interest is due on February 17, 2018. The note is convertible at any time following 90 days after the issuance date at noteholders option into shares of our common stock at a variable conversion price of 90% of the average five day market price of our common stock during the 5 trading days prior to the notice of conversion, subject to adjustment as described in the note. The holder’s ability to convert the note, however, is limited in that it will not be permitted to convert any portion of the note if the number of shares of our common stock beneficially owned by the holder and its affiliates, together with the number of shares of our common stock issuable upon any full or partial conversion, would exceed 4.99% of the Company’s outstanding shares of common stock. On December 31, 2015, the Company re-negotiated accrued salaries and interest for three employees and a director. Under the terms of the agreements, $343,687 of accrued salaries and director fees not previously converted were converted to promissory notes convertible into common stock with a warrant feature. The $343,687 face value promissory notes are unsecured, due five years from issuance, and bear an interest rate of 10%. At the investor’s option until the repayment date, the note may be converted to shares of the Company’s common stock at a fixed price of $0.02 per share along with additional warrants to purchase one share for every two shares issued at the exercise price of $0.02 per share for three years after the conversion date. The Company has determined the value associated with the beneficial conversion feature in connection with the notes to be $341,703. The aggregate beneficial conversion feature has been accreted and charged to interest expenses as a financing expense in the amount of $34,039 during the six months ending June 30, 2016. The beneficial conversion feature is valued under the intrinsic value method. On March 30, 2016, the Company re-negotiated accrued directors fees of 3,600. Under the terms of the agreements, $3,600 of accrued director fees not previously converted were converted to promissory notes convertible into common stock with a warrant feature. The $3,600 face value promissory notes are unsecured, due five years from issuance, and bear an interest rate of 10%. At the investor’s option until the repayment date, the note may be converted to shares of the Company’s common stock at a fixed price of $0.02 per share along with additional warrants to purchase one share for every two shares issued at the exercise price of $0.02 per share for three years after the conversion date. The Company has determined the value associated with the beneficial conversion feature in connection with the notes to be $nil under the intrinsic value method. On April 30, 2016, the Company re-negotiated accrued salaries and interest for an employee. Under the terms of the agreements, $33,333 of accrued salaries were converted to promissory notes convertible into common stock with a warrant feature. The $33,333 face value promissory notes are unsecured, due five years from issuance, and bear an interest rate of 10%. At the investor’s option until the repayment date, the note may be converted to shares of the Company’s common stock at a fixed price of $0.02 per share along with additional warrants to purchase one share for every two shares issued at the exercise price of $0.02 per share for three years after the conversion date. The Company has determined the value associated with the beneficial conversion feature in connection with the notes to be $8,401. The aggregate beneficial conversion feature has been accreted and charged to interest expenses as a financing expense in the amount of $247 during the six months ending June 30, 2016. The beneficial conversion feature is valued under the intrinsic value method. The Company is authorized to issue 200,000,000 shares of $0.001 par value common stock. The Company had 117,073,969 and 115,701,969 issued and outstanding shares of common stock as of June 30, 2016 and December 31, 2015, respectively. On March 30, 2016, 72,000 shares of the Company’s common stock were issued to settle $3,600 of accrued expenses due to a director of the Company. A gain of $2.592 was recognized as a result of this settlement. On January 27, 2016, the Company entered into a promissory note and pursuant to its terms the Company issued the holder 100,000 shares of its common stock valued at $0.02 per share. The shares were fair valued at $2,000 or $0.02 per share. On January 27, 2016, the Company entered into a promissory note and pursuant to its terms the Company issued the holder 200,000 shares of its common stock valued at $0.02 per share. The shares were fair valued at $4,980 or $0.0249 per share. On February 1, 2016, the Company entered into a promissory note and pursuant to its terms the Company issued the holder 400,000 shares of its common stock valued at $0.02 per share. The shares were fair valued at $9,960 or $0.0249 per share. On February 1, 2016, the Company entered into a promissory note and pursuant to its terms the Company issued the holder 250,000 shares of its common stock valued at $0.02 per share. The shares were fair valued at $6,225 or $0.0249 per share. On February 2, 2016, the Company issued of 400,000 shares of the Company’s common stock to five consultants for services related to the Company’s financing. The shares were fair valued at $9,960 or $0.0249 per share. Rental expense, resulting from operating lease agreements, approximated $21,572 and $21,832 for the six months ended June 30, 2016 and 2015, respectively. § Kintari acquired the right to appoint sub-licensees provided that Skinvisible approves in advance. § If Skinvisible desires to sell an OTC product, it must first notify Kintari. If Kintari desires to exercise the right-of-first-refusal on that OTC product, Kintari must launch the product within 6 months or lose it to Skinvisible. § Kintari agreed to purchase the existing product inventory, raw ingredients, packaging materials plus all Kintari marketing materials for a total of $87,720.14. Kintari has not yet paid this amount and the parties are waiting for fundraising in connection with an offering to do so. § Skinvisible agreed to sell its polymers to Kintari and Kintari will manufacture the products using those polymers. § Kintari may use any of Skinvisible’s existing trademarks. § Kintari agreed to pay to Skinvisible an on-going royalty of 5% on revenue generated from the products. § Kintari agreed to pay to Skinvisible a minimum annual royalty equal to $50,000 for the first year after launch, $100,000 for the second year after launch and $150,000 for the third year after launch and each subsequent year for the term of the agreement. § Kintari agreed to pay to Skinvisible a royalty of 25% of any non-royalty payments received by Kintari from sub-licensees, including fees received in consideration for sublicensing the products. § The agreement may be terminated by, among other things, a mutual consent of the parties or a breach and failure to cure by one of the parties. Kintari Int. Inc. commenced business in April 2016 in the U.S. and expects to begin operations in Canada in September 2016. Kintari Int. Inc. is the parent company to Kintari USA Inc. and Kintai Canana Inc. These companies will be used as operating entities to market and sell the products. Kintari Int. Inc. will need to raise capital of at least $2 million to assist with its development and payments to the Company. Kintari Int. Inc. plans to seek a TSX Venture Exchange listing upon completion of this financing. We, through our wholly owned subsidiary Skinvisible Pharmaceuticals Inc., are a pharmaceutical research and development (“R&D”) company that has developed and patented an innovative polymer delivery system, Invisicare® and formulated over forty topical skin products, which we out-license globally. We were incorporated in 1998, and target an estimated $80 billion global skincare and dermatology market and a $30 billion global over-the-counter market as well as other healthcare / medical and consumer goods markets. With the research and development complete on forty products and numerous patents issued (technology and product patents), we are ready to monetize our investment. Our business model will continue to be to out-license our patented prescription and over-the-counter (“OTC”) products featuring Invisicare to established manufacturers and marketers of brands internationally and to maximize profits from the products we have already out-licensed. We have also formed a commercial subsidiary, Kintari Int. Inc. with subsidiaries Kintari USA Inc. and Kintari Canada Inc., in order to take our cosmeceutical and select OTC products with Invisicare to market. The opportunity for us to license our products continues to be a viable model as the need for pharmaceutical companies to access external R&D companies for new products due to their own down-sizing or elimination of internal R&D departments. The demand for our products is enhanced due to the granting of key US and international patents and the completed development of a number of unique products. 4. Boost licensing revenues by securing additional licensees globally and develop a robust royalty revenue stream that will finance our future growth. On September 9, 2014, we formed Kintari USA Inc., a new wholly-owned subsidiary of Kintari International Inc., wholly-owned subsidiary of Skinvisible, Inc., to market a premium line of scientifically formulated skincare products powered by our patented Invisicare® technology. We launched Kintari USA Inc. on January 15, 2015. As part of our strategic focus on revenue generation and creating shareholder value, our products will be sold via network marketing. We expect that products will be sold in the US and in Canada in September, 2016. In addition, we launched DermSafe in August, 2016 in Canada through our Kintari Canadian website for retail customers only. Also in July, 2016, we announced that Kintari Canada made a donation of DermSafe to the Canadian Olympic Foundation offering protection for Canada’s athletes during the upcoming Olympic Games in Rio. The Kintari product portfolio consists of 2 anti-aging products to help fight the signs of aging and a broad spectrum sunscreen along with our newest product: Kintari’s Hand & Body lotion. All products are made with our patented Invisicare technology. Our anti-aging products have been developed using proven anti-aging ingredients with scientific evidence of their effectiveness at reducing the look of fine lines and wrinkles resulting in youthful looking skin. These potent ingredients will be powered by patented Invisicare technology, providing consumers with unique, effective products which we believe cannot be duplicated. Claim # 2 – Water-Resistant 80 Minutes: The FDA sunscreen water resistant claim requires that a sunscreen must have the same SPF after being in water or sweating for 40 or 80 minutes. Our testing was conducted at an independent laboratory specializing in sunscreen testing. The test involved human subjects that applied sunscreen to their arm, followed by the immersion of the arm into a Jacuzzi for 80 minutes (10 minutes in / 10 minutes out). Our sunscreen successfully completed this testing and is allowed to use “Water-resistant for 80 Minutes” on its sunscreen label, the longest length of time allowed by the FDA. Claim # 3 – Unique Patented Technology / Eight-Hour Photostability: As previously announced, we were granted a patent from the United States Patent and Trademark Office entitled “Sunscreen Composition with Enhanced UVA Absorber Stability and Methods”, which provides protection until November 2029. Skinvisible successfully formulated a unique Invisicare® delivery system specifically for stabilizing avobenzone; the key sunscreen used in the USA. Data submitted to the US patent office proved that our sunscreen provides a minimum of eight hours of photostability. Our Hand & Body Lotion is formulated with five moisturizers including aloe, shea butter, glycerin, coconut oil and jojoba oil, and to help smooth your skin the powerful antioxidant Vitamin E. These ingredients restore and nourish your skin from head to toe. Kintari Canada Inc. launched Skinvisible’s product DermSafe, its non-alcohol hand sanitizer, in conjunction with the Olympic Games in Rio. Kintari Canada supplied the product to all Canadian Olympic athletes, trainers and support staff. This coincided with the launch of the Kintari Canada website where DermSafe is available for purchase. Kintari Canada will officially launch in Q3 / Q4 of this year and offer other products and distributor opportunities. (See below under Product Updates for more information). We have licensees around the globe. Two of these licensees are currently in the marketplace: Avon Products globally and Women’s Choice Pharmaceuticals in the United States. We continue to work diligently with our licensees to ensure they have a smooth manufacturing process, ongoing R&D support and marketing feedback. Product: We have a long-term contract with Avon globally for over ten years to provide Invisicare polymer for their long-lasting lipsticks. Sales: Invisicare polymers are purchased directly from Skinvisible. Product: ProCort®, long lasting prescription hemorrhoid cream launched in the United States August 2011. Sales and Royalties: Skinvisible receives a royalty based on net sales of ProCort. This past year Women's Choice Pharmaceuticals LLC partnered with Advanced Medical Enterprises, LLC to market ProCort® in Puerto Rico. With over thirty pharmaceutical sales reps calling on OBGYNs in the US, Women’s Choice has been successfully growing their sales of ProCort® and we look forward to increased growth in 2016. Women’s Choice is seeking to form other strategic alliances in order to increase its sales efforts by targeting new territories and targeting medical specialists which previously were not called upon. We have additional information on specific products which add value to Skinvisible’s product pipeline. Skinvisible’s hand sanitizer formulated with Invisicare® and chlorhexidine gluconate has been launched in Canada by subsidiary Kintari Canada Inc. where it has Health Canada approval.. We are currently seeking licensees and/or distributors to begin the sale of DermSafe in Asia and in the EU. This registration has recently been granted for a ten year term to expire in 2024. Sunless Tanning Products: We have developed a new sunless tanning mousse / foam which uses a unique foam with Invisicare®, developed specifically for its foaming properties. This adds to Skinvisible’s line of sunless tanning products which includes sunless tanning lotions (light, medium and dark), pre-sun moisturizer and after-sun moisturizer along with sunless tanning spray products for commercial use. The addition of a sunless tanning mousse enhances this line of products. Sunscreen Products: We have developed 3 broad spectrum sunscreens, with SPF 15, 30 and 50 (the highest SPF allowed by the FDA). All are formulated with Avobenzone, the only UVA sun filter allowed under the US FDA monograph. This UVA/UVB sunscreen was granted a patent from the United States patent office in 2013. Avobenzone is known for breaking down in the sun after only two hours – thus the requirement to reapply every 2 hours. Skinvisible’s patent was granted based on Invisicare's® minimum 8 hour photo stability. For countries outside the United States, Skinvisible has additionally patented UVA/UVB sunscreens formulated with Tinosorb S.
Our clinical strategy is to find a partner for our prescription product portfolio. This would allow for a partner to seek FDA approval using the 505b2 pathway for one or more of our products. 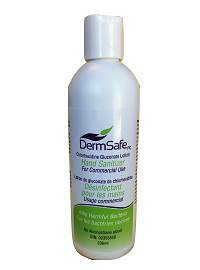 Launch of our DermSafe® hand sanitizer in Canada under Kintari. In 2013, we commissioned an independent laboratory to further analyze the long-term effectiveness of DermSafe® when put in contact with two bacteria; the “super bug” MRSA and E. coli, the “restaurant bug” since it is often transmitted by food and food handlers. The long-term effectiveness of two bacteria; Methicillin-resistant Staphylococcus aureus or MRSA (ATCC #33591) and Escherichia coli or E. coli (ATCC #43888") were tested up to four hours after application. The results showed that the individual arms of subjects which had DermSafe® applied and were even rinsed prior to each bacteria challenge, showed a 95.83% reduction at the 4 hour time point for MRSA and 99.38% for E. coli. In 2013, we obtained the registration rights for DermSafe® in Belgium. This designation allows for the sale and/ or registration of DermSafe in most EU countries. A strategy is being developed along with a larger global strategy to bring DermSafe to the EU and. Skinvisible has also commissioned further testing of DermSafe against the (Middle East Respiratory Syndrome Coronavirus (MERS-CoV); a SARS-like virus and the avian influenza A virus, H7N9. We continue to enhance our product developed for Netherton syndrome t. Netherton syndrome is a disease caused by a genetic defect which causes the skin to continually exfoliate, never forming a skin bond. This leaves the patient highly susceptible to infection and dealing with a life-long condition that has no cure. Our product has shown excellent results in lab studies blocking the enzyme that breaks down the skin and we are seeking “Orphan Drug” designation in both the US (FDA) and Europe (EMA). We continue to investigate means to reformulate our product to better meet the demands of this very debilitating disease and are undergoing preliminary proof-of-concept investigations on Netherton syndrome. The advantages of obtaining Orphan Drug designation is that it provides various incentives including a reduction or elimination of registration and market authorization fees, protocol assistance, and seven years of market exclusivity for the product in the US and ten years in Europe. There can be no assurances that our project will be successful. We are in discussions and undergoing internal discussions with various pharmaceutical companies for licenses. To facilitate further expansion, we are seeking an exclusive license with a proven US or global based Pharmaceutical Company for our existing Rx product formulations. The licensee would be expected to pay all costs in getting FDA approval. The licensee would pay Skinvisible for the license in milestone payments as Clinical Phases are proven. Our revenue from product sales, royalties on patent licenses and license fees for the three months ended June 30, 2016 was $38,114, a decrease from $54,676 for the same period ended June 30, 2015. Our revenue from product sales, royalties on patent licenses and license fees for the six months ended June 30, 2016 was $66,451, a decrease from $128,051 for the same period ended June 30, 2015. The decrease in revenue for the three and six months ended June 30, 2016 was mainly due to a reduction in product sales. Our initial foray into network marketing was the main reasons for the decrease in sales. Several distributors were not successful in selling product and much of the product actually sold by these individuals was returned. Moreover, we ultimately terminated several of these distributorships, which resulted in repurchasing product. We are currently in the process of revamping our network marketing program. We expect to sign new distributors in the coming months. We launched Kintari USA Inc. on January 15, 2015. As part of our strategic focus on revenue generation and creating shareholder value, as explained above, our products will be sold via network marketing. We expect that products will be sold in the US and in Canada using this method in Q3 2016. In addition, we launched the sale of DermSafe in August, 2016 in Canada through our Kintari Canadian website for retail customers only. Our cost of revenues for the three months ended June 30, 2016 decreased to $9,385 from the prior year period when cost of revenues was $41,235. Our cost of revenues for the six months ended June 30, 2016 decreased to $14,012 from the prior year period when cost of revenues was $46,188. Our cost of revenues decreased for the three and six months ended June 30, 2016 over the prior year periods as a result of decreased product sales. We expect our cost of revenues to increase as we continue to push sales from Kintari USA and Canada. Gross profit for the three months ended June 30, 2016 was $28,729, or approximately 75% of sales. Gross profit for the three months ended June 30, 2015 was $13,441, or approximately 25% of sales. Gross profit for the six months ended June 30, 2016 was $52,439, or approximately 79% of sales. Gross profit for the six months ended June 30, 2015 was $81,863, or approximately 64% of sales. Our gross profit margin increased in 2016 as compared with 2015 as a result of scaling our manufacturing and packaging. We expect this trend to continue into 2016. Operating expenses decreased to $201,509 for the three months ended June 30, 2016 from $307,421 for the same period ended June 30, 2015. Operating expenses decreased to $539, 296 for the six months ended June 30, 2016 from $673,915 for the same period ended June 30, 2015. Our operating expenses for the six months ended June 30, 2016 consisted mainly of accrued salaries and wages of $187,352, consulting fees of $195,143, depreciation and amortization expenses of $28,953, accounting and audit expenses of $24,046, salaries and wages of $14,333 and rent of $21,572. In comparison, our operating expenses for the six months ended June 30, 2015 consisted mainly of salaries and wages of $121,790, accrued salaries and wages of $143,869, commissions of $91,090, consulting fees of $88,206, research and development of $30,217, depreciation and amortization expenses of $28,746, accounting and audit expenses of $21,092 and rent of $21,832. We had other expenses of $291,152 for the three months ended June 30, 2016, compared with other expenses of $210,867 for the three months ended June 30, 2015. Other expenses was the result of interest expenses for the three months ended June 30, 2016 from $212,307 in interest expenses from prior period ended June 30, 2015. We had other expenses of $606,428 for the six months ended June 30, 2016, compared with other expenses of $416,506 for the three months ended June 30, 2015. This was largely the result of $609,020 in interest expenses for the six months ended June 30, 2016 from $417,972 in the prior period ended June 30, 2015. We expect to continue to experience high interest payments in the future as a result of our outstanding liabilities. Moreover, as of the date of this report, there are a number of secured promissory notes with an aggregate principal amount of approximately $1,779,100 that have matured. In addition, we also have a number of unsecured promissory notes with an aggregate principal amount of $86,479 that have matured. If we are unable to generate sufficient revenues and/or additional financing to service this debt, there is a risk the lenders will call the notes, secure our assets, as to those applicable secured notes, and demand payment. If this happens, we could go out of business. We recorded a net loss of $463,932 for the three months ended June 30, 2016, as compared with a net loss of $504,847 for the three months ended June 30, 2015. We recorded a net loss of $1,093,285 for the six months ended June 30, 2016, as compared with a net loss of $1,008,558 for the six months ended June 30, 2015. As of June 30, 2016, we had total current assets of $96,167 and total assets in the amount of $370,626. Our total current liabilities as of June 30, 2016 were $6,749,755. We had a working capital deficit of $6,653,588 as of June 30, 2016. Operating activities used $92,246 in cash for the six months ended June 30, 2016. Our net loss of $1,093,285 was the main component of our negative operating cash flow, offset mainly by an increase in accounts payable and accrued liabilities of $426,354, amortization of debt discount of $292,516 and stock based compensation of $133,445. Cash flows provided by financing activities during the six months ended June 30, 2016 amounted to $92,246 and consisted of $83,000 in proceeds from convertible notes payable, $57,000 in proceeds from notes payable and $23,746 in related party debt, offset by $47,500 in payments on convertible debt and $24,000 in payments on notes payable. On January 27, 2016, we entered into a promissory note pursuant to which we borrowed $33,000. Interest under the note is at 12% per annum, and the principal and all accrued but unpaid interest is due on April 30, 2016. The note also grants the holder 100,000 shares of our common stock valued at $0.02 per share. The maturity has been extended to May 30, 2016. On January 27, 2016, we entered into a promissory note pursuant to which we borrowed $24,000. Interest under the note is at 10% per annum, and the principal and all accrued but unpaid interest was due on February 15, 2016. The note also grants the holder 200,000 shares of our common stock valued at $0.02 per share. On February 1, 2016, we entered into a convertible promissory note pursuant to which we borrowed $38,000. Interest under the note is at 10% per annum, and the principal and all accrued but unpaid interest is due on February 15, 2017. The note also grants the holder 400,000 shares of our common stock valued at $0.02 per share. Also, upon written request by the holder, the principal of the loan may be converted into common shares at the price of $0.02 per share plus ½ warrant at any time up until February 1, 2017. Warrants shall be issued at $0.02 per share and may be converted equal to 1 share for every 2 warrants issued and shall expire 1 year from conversion of the loan conversion date. On February 1, 2016, we entered into a convertible promissory note pursuant to which we borrowed $25,000. Interest under the note is at 10% per annum, and the principal and all accrued but unpaid interest is due on May 17, 2016. The note also grants the holder 250,000 shares of our common stock valued at $0.02 per share. Also, upon written request by the holder, the principal of the loan may be converted into common shares at the price of $0.02 per share plus ½ warrant at any time up until July 25, 2016. Warrants shall be issued at $0.02 per share and may be converted equal to 1 share for every 2 warrants issued and shall expire 1 year from conversion of the loan conversion date. On February 17, 2016, we entered into a convertible promissory note pursuant to which we borrowed $20,000. Interest under the convertible promissory note is 9% per annum, and the principal and all accrued but unpaid interest is due on February 17, 2018. The note is convertible at any time following 90 days after the issuance date at noteholders option into shares of our common stock at a variable conversion price of 90% of the average five day market price of our common stock during the 5 trading days prior to the notice of conversion, subject to adjustment as described in the note. The holder’s ability to convert the note, however, is limited in that it will not be permitted to convert any portion of the note if the number of shares of our common stock beneficially owned by the holder and its affiliates, together with the number of shares of our common stock issuable upon any full or partial conversion, would exceed 4.99% of our outstanding shares of common stock. As of June 30, 2016, there were no off balance sheet arrangements. Going concern – The accompanying financial statements have been prepared on a going concern basis, which contemplates the realization of assets and the satisfaction of liabilities in the normal course of business. We have incurred cumulative net losses of $28,924,637 since our inception and require capital for our contemplated operational and marketing activities to take place. Our ability to raise additional capital through the future issuances of common stock is unknown. The obtainment of additional financing, the successful development of our contemplated plan of operations, and our transition, ultimately, to the attainment of profitable operations are necessary for us to continue operations. The ability to successfully resolve these factors raise substantial doubt about our ability to continue as a going concern. These consolidated financial statements do not include any adjustments that may result from the outcome of these aforementioned uncertainties. Royalty sales – We also recognize royalty revenue from licensing our patented product formulations only when earned, with no further contingencies or material performance obligations are warranted, and thereby have earned the right to receive and retain reasonably assured payments. Distribution and license rights sales – We also recognize revenue from distribution and license rights only when earned (and are amortized over a five year period), with no further contingencies or material performance obligations are warranted, and thereby have earned the right to receive and retain reasonably assured payments. Accounts Receivable – Accounts receivable is comprised of uncollateralized customer obligations due under normal trade terms requiring payment within 30 days from the invoice date. The carrying amount of accounts receivable is reviewed periodically for collectability. If management determines that collection is unlikely, an allowance that reflects management’s best estimate of the amounts that will not be collected is recorded. Management reviews each accounts receivable balance that exceeds 30 days from the invoice date and, based on an assessment of creditworthiness, estimates the portion, if any, of the balance that will not be collected. As of June 30, 2016, the Company had not recorded a reserve for doubtful accounts. The Company has $1,000,000 in convertible notes payable which are secured by the accounts receivable of a license agreement the Company has with Women's Choice Pharmaceuticals, LLC on its proprietary prescription product, ProCort®. We carried out an evaluation of the effectiveness of the design and operation of our disclosure controls and procedures (as defined in Exchange Act Rules 13a-15(e) and 15d-15(e)) as of June 30, 2016. This evaluation was carried out under the supervision and with the participation of our Chief Executive Officer and our Chief Financial Officer. Based upon that evaluation, our Chief Executive Officer and Chief Financial Officer concluded that, as of June 30, 2016, our disclosure controls and procedures were not effective due to the presence of material weaknesses in internal control over financial reporting. A material weakness is a deficiency, or a combination of deficiencies, in internal control over financial reporting, such that there is a reasonable possibility that a material misstatement of the company’s annual or interim financial statements will not be prevented or detected on a timely basis. Management has identified the following material weaknesses which have caused management to conclude that, as of June 30, 2016, our disclosure controls and procedures were not effective: (i) inadequate segregation of duties and effective risk assessment; and (ii) insufficient written policies and procedures for accounting and financial reporting with respect to the requirements and application of both US GAAP and SEC guidelines. Our company plans to take steps to enhance and improve the design of our internal controls over financial reporting. During the period covered by this quarterly report on Form 10-Q, we have not been able to remediate the material weaknesses identified above. To remediate such weaknesses, we plan to implement the following changes during our fiscal year ending December 31, 2016: (i) appoint additional qualified personnel to address inadequate segregation of duties and ineffective risk management; and (ii) adopt sufficient written policies and procedures for accounting and financial reporting. The remediation efforts set out are largely dependent upon our securing additional financing to cover the costs of implementing the changes required. If we are unsuccessful in securing such funds, remediation efforts may be adversely affected in a material manner. There were no changes in our internal control over financial reporting during the three months ended June 30, 2016 that have materially affected, or are reasonable likely to materially affect, our internal control over financial reporting. The information set forth below relates to our issuances of securities without registration under the Securities Act of 1933 during the reporting period which were not previously included in a an Annual Report on Form 10-K, Quarterly Report on Form 10-Q or Current Report on Form 8-K.
On June 30, 2016, we issued a promissory note to Terry Howlett in the principal amount of $98,480 in consideration of accrued salary and bonuses due from January 1, 2016 to June 30, 2016. The note bears interest at 10% per annum and matures on June 30, 2021. The note provides Mr. Howlett the right to convert the principal amount of the loan into our common stock at $0.02 per share at any time until June 30, 2021. If exercised, we also agreed to issue a three year warrant to purchase an aggregate amount of 2,462,000 shares of common shares at a strike price of $0.02 per share. On June 30, 2016, we issued a promissory note to Doreen McMorran in the principal amount of $78,870.40 in consideration of accrued salary and bonuses due from January 1, 2016 to June 30, 2016. The note bears interest at 10% per annum and matures on June 30, 2021. The note provides Ms. McMorran the right to convert the principal amount of the loan into our common stock at $0.02 per share at any time until June 30, 2021. If exercised, we also agreed to issue a three year warrant to purchase an aggregate amount of 1,971,760 shares of common shares at a strike price of $0.02 per share. On June 30, 2016, we issued a promissory note to an employee in the principal amount of $11,467.30 in consideration of accrued salary and bonuses due from January 1, 2016 to June 30, 2016. The note bears interest at 10% per annum and matures on June 30, 2021. The note provides the employee the right to convert the principal amount of the loan into our common stock at $0.02 per share at any time until June 30, 2021. If exercised, we also agreed to issue a three year warrant to purchase an aggregate amount of 286,683 shares of common shares at a strike price of $0.02 per share. We granted Greg McCartney the right to convert his accrued director compensation of $3,600 as of June 30, 2016 into our common stock at $0.02 per share at any time until June 30, 2021. If exercised, we also agreed to issue a three year warrant to Mr. McCartney to purchase an aggregate amount of 90,000 shares of common shares at a strike price of $0.02 per share. We granted an employee the right to convert his accrued compensation of $33,333.33 as of April 30, 2016 into our common stock at $0.02 per share at any time until December 31, 2021. If exercised, we also agreed to issue a three year warrant to purchase an aggregate amount of 833,333 shares of common shares at a strike price of $0.02 per share. 101** The following materials from the Company’s Quarterly Report on Form 10-Q for the quarter ended June 30, 2016 formatted in Extensible Business Reporting Language (XBRL).